When will be Apres Match of the Day next episode air date? 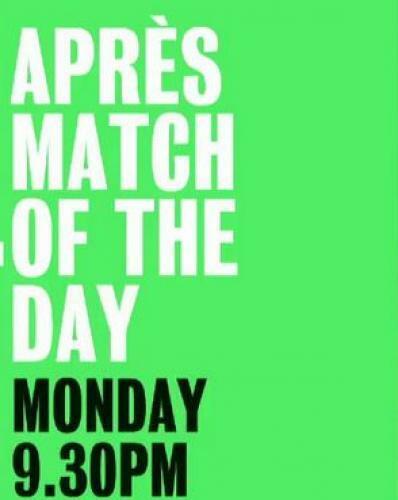 Is Apres Match of the Day renewed or cancelled? Where to countdown Apres Match of the Day air dates? Is Apres Match of the Day worth watching? Après Match of the Day sees Ireland's premier league comedy team bring back to life the matches that defined three decades of glory with the type of post and pre-match analysis that we wish we'd had back then. See Bill, John and Liam hilariously recreated as they were back then along with a host of other household names from back in the day. Golden moments, brand new comedy from RTÉ2.Après Match of the Day brings us back to the great euphoria of Ireland's glorious victory over Russia at Dalymount Park in 1974, the goal that defined a generation of hope when Ray Houghton hit the net in the Giants Stadium in the U.S. in 1994, could these moments get any better? The answer is yes because the Après team are in town playing with the benefit of hindsight and comedy genius.Bill O'Herlihy, Eamon Dunphy and Liam Brady will be there as usual but given a youthful make-over to recreate them as they were back in the day, alongside iconic figures including Big Jack, Joe Kinnear, Don Givens, the BBC's Jimmy Hill plus many more very special guests from the era.Après Match of the Day brings us our favourite football moments with the type of pre and post match analysis we wish we'd had back then and delivers brand new original comedy to Irish viewers for RTÉ2. Barry Murphy, Risteard Cooper and Gary Cooke take a sideways look at the quarter-final of the 1990 Irish Masters, with Alex 'Hurricane' Higgins leaving a trail of devastation as he faced Dennis Taylor. Apres Match of the Day next episode air date provides TVMaze for you. EpisoDate.com is your TV show guide to Countdown Apres Match of the Day Episode Air Dates and to stay in touch with Apres Match of the Day next episode Air Date and your others favorite TV Shows. Add the shows you like to a "Watchlist" and let the site take it from there.